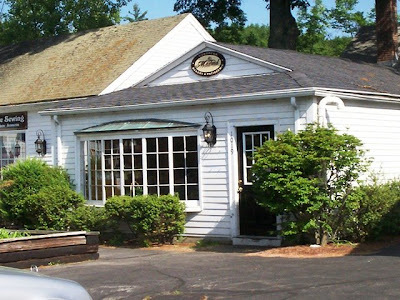 As you may have read in our "restaurant graveyard" section, Esler's American Bakery in Marlboro, MA, has closed. New England Bites is always sad to learn of the passing of an eatery, especially during these tough times. 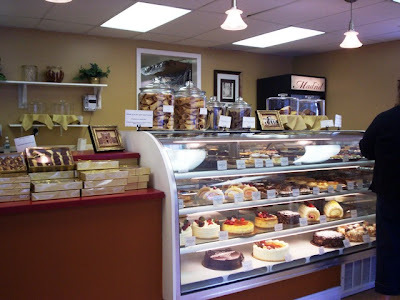 However, we noticed on our last trip to the Wayside Country Store, which is in the same plaza where this bakery was located, that the building was being renovated. Like a super sleuth, I called Esler's old number a few weeks ago to see if a) Esler's had returned, or b) something new had taken over. What I thought I heard was an Asian gentleman telling me that, in Esler's place, was a Mandarin bakery. Mom had always wanted to visit an Asian bakery because she wants to try pork buns, which are little buns with spicy Asian pork inside. 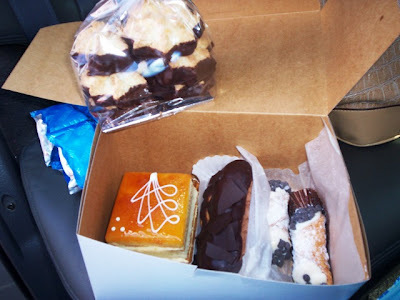 Not wanting to disappoint Mom, we took the long drive to Marlboro to check out this Mandarin bakery. Lo and behold, I was completely wrong about what I'd heard over the phone. It wasn't a Mandarin bakery with Asian employees. It was a bakery called MADRID with European employees! Oops. Good thing Mom didn't run in there asking for pork buns. We would have gotten a few blank stares. Luckily for us, my misinterpretation of what was said on the phone brought us to Marlboro to try some of the best pastries we've ever had. We entered Madrid a little after 4 p.m. Inside was a large cooler display case featuring several mouthwatering cakes and desserts. 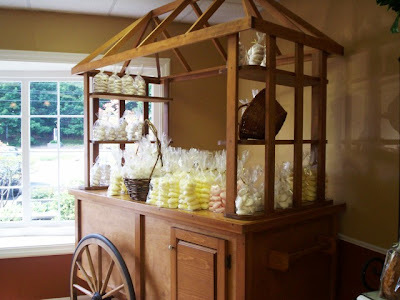 Scattered around the bright and sunny room were bags of colorful meringues, loafs of fresh tea cakes and breads, and boxes of homemade cookies. Mom and I didn't know where to look first. Luckily for us, a woman, who we believed to be the owner, emerged from the back and greeted us. She was very polite and was more than willing to answer any questions we may have had, and informed us that she had just gotten through putting out the freshly baked tea cakes. No wonder it smelled so good in there! She also offered Mom and I pink and yellow meringues, which melted in our mouths. With Mom spinning herself silly (we all know how excited she gets in bakeries), the woman behind the counter continued to explain that everything sold at Madrid has been made on the premises. Mom spotted a jar of empty cannoli shells, and the owner told us that the reason she doesn't like to fill the cannolis right away is because they always taste better when they've been freshly stuffed. Right on! No one likes a soggy cannoli. After a few minutes of staring at everything with our mouths open, we decided to buy something. Mom picked up a bag of chocolate dipped coconut macaroons to take home ($5.95), and we decided to get a few real cream desserts that we already knew wouldn't make it back home in one piece. During this time, a woman came in to pick up a cake she had ordered. It looked beautiful, and as she stuffed herself with the free meringues, she ordered a box of pastry and some extra goodies to eat in the car. Hmm ... could she be a long lost relative that we don't know about? Yes, Madrid is very expensive. However, considering that we've never seen any bakery quite like this one, and it has some of the most beautiful homemade desserts that we've ever seen, it is really worth the money. For all the work that goes into these items, they have the right to charge a higher price than someone who just slaps a donut on a piece of wax paper. You have to pay for quality. When we left Madrid, the woman told us to tell our friends about the bakery. Although our friends will probably think that we're crazy for spending $17.90 on pastry, we didn't care. We couldn't wait to try something - and that moment came as soon as we got to the car. We busted out the two cannolis and chowed down. The smaller size was great for a two- or three-bite dessert. Mom loved the fact that they were freshly filled. The cannoli cream was very light and delicate, while the shell itself was fresh, crisp, and lightly dusted with powdered sugar. 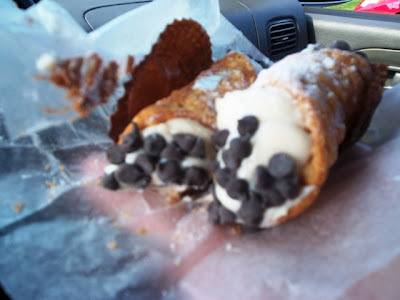 It was a really tasty treat, and wasn't overwhelming heavy like a lot of cannolis are. We also liked that the shell wasn't covered in chocolate. Those type of shells taste good, but they break easily and it's almost like you can't taste the cream inside because of all the chocolate. As for the two remaining desserts, they lasted until the evening. After we did our grocery shopping, we decided to finish them off. Just like last week's "cookies on the dashboard," we ended this lovely day of errands with "pastries on the driver's seat." We even decided to purchase some cutlery for the car to go with our freezer bag since we do a lot of "dashboard dining." Of course, we split each one in two so that each of us could taste both pastries. We loved how each dessert was placed on its own small cardboard tray. It really made for an easy transition from the box to the plate. First, we had the San Marcos. Both Mom and I thought the San Marcos tasted like a marriage between creme brulee and tiramisu. The cake layers with the cream in between definitely had a tiramisu feel to them, but the caramel top was definitely creme brulee. Together, they were fantastic. This is the kind of dessert that would be a big hit if you really wanted to impress your guests. The chocolate eclair was excellent. Instead of being filled with the typical boiled (Boston) cream, it was filled with a chocolate pastry cream. 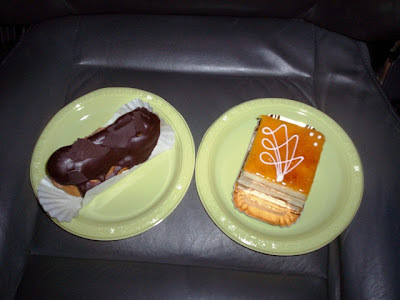 It was very different from the eclairs that are found in local bakeries. It was almost overflowing with cream and topped with a thin layer of chocolate ganache. The pastry itself was fresh and flaky. 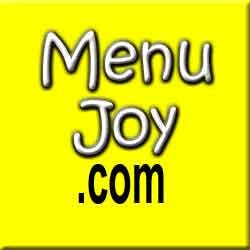 This is definitely another dessert that is suitable both for family and friends. Once we got the macaroons - the only remaining dessert - home, we shared them with Dad. 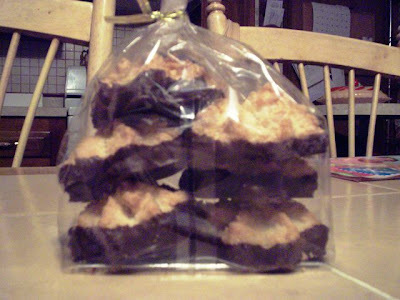 The macaroons came six to a pack and had a chocolate bottom. Mom and I found them to be very flavorful and crisp, and the chocolate at the end gave it a nice touch. Dad would have preferred them to be a little chewier, but he still thought they were very tasty. Oh Dad, this is why we leave you out of most of the food trials. Tacos are too spicy, ice cream is too sweet - it's supposed to be!!! Either way, the macaroons were a big hit, along with the other delicious goodies we picked up at Madrid. Mandarin bakery or not, we love Madrid. However, we're really not sure how well they're going to do considering the current state of the economy. Not everyone is going to want to run out and buy a few pastries for $20. We hope and pray that people are willing to splurge on these fine European pastries because they really are worth trying. We saw a cannoli cake that was to die for (approximately $25) and we almost drove back to pick up a box of caramel-filled cookies that were dipped in chocolate. This bakery is one of a kind. They don't just sell pastries, they create beautiful works of art. You're almost afraid to eat them because you'll ruin the exquisite design (somehow we got over that fast). We will absolutely be stopping in again, and we hope you do the same. 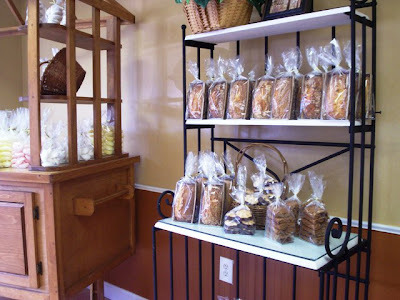 Madrid European Bakery & Patisserie is open from 8 a.m. to 6 p.m. Tuesday through Saturday, and 8 a.m. to 4 p.m. on Sunday. They are closed on Monday.